Bishop Kieran O’Reilly SMA, Bishop of Killaloe and former SMA Superior General, preached at the Closing Mass of the SMA National Novena in honour of Our Lady which took place at Knock Shrine on Saturday, 25 May 2013. The following is an edited version of the homily the Bishop delivered to the pilgrims, both from the SMA Pilgrimage and other groups who joined with the SMA and OLA Sisters in the Mass. I join with Fr John Dunne in welcoming all of you – SMA and Sisters of Our Lady of Apostles – supporters and friends, all of us pilgrims to Our Lady’s Shrine here in Knock. Also members of other Religious congregations, individual pilgrims and a pilgrim group from the Diocese of Paisley led by retired Bishop John Mone. This is the 33rd SMA Pilgrimage to Our Lady’s Shrine here at Knock and is celebrated at the close of the SMA Novena in honour of Our Lady. Around the Basilica today we hear the different accents of the pilgrims from the four corners of Ireland and further afield. Fr Damian Bresnahan of the Provincial Council and the five FVC Directors – Frs John Bowe, Lee Cahill, Brendan Dunning, Fergus Tuohy and John O’Brien – have put a lot of effort into organising our pilgrimage here today. As, indeed, the many people who have helped with the music and liturgy preparations for the Pilgrimage – it is wonderful to see so many of our FVC members arriving in Coaches, Minibuses and cars. 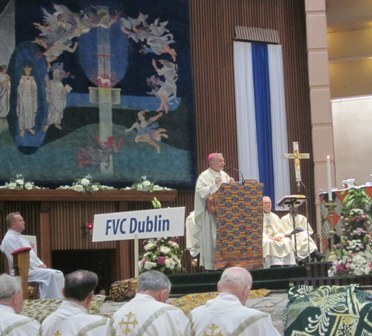 I welcome all who are on pilgrimage here in the basilica this afternoon and I invite you to travel with us during this liturgy to the great continent of Africa where many of our missionaries – priests, religious and lay missionaries have worked to spread the Gospel over many years. We invite you to join with us in this celebration of joy. Today’s readings from Scripture – from Isaiah 9 and the Gospel from Luke’s Infancy narrative – are normally heard at Christmas when we are in the time of the shortest days of the year. We now read these texts when we are at the moment of the longest and brightest time of the year. It is good to bring these readings into the light of the brightest time of the year. Missionaries have continually answered that call to go… it is re-echoed in other passages in the Gospel of Luke – in a key passage is to be found in Chapter 9 when Jesus sets his sights on Jerusalem, “he resolutely turned his face to Jerusalem”. St Luke’s Gospel is a Gospel of movement with the disciples invited to participate and partake in the Life and mission of Jesus as he journeys to Jerusalem. The phrase “Set out into the deep” comes from Luke 5 and is the opening theme of Blessed Pope John Paul II’s invitation as we embarked on a new millennium. “At the beginning of the new millennium, and at the close of the Great Jubilee during which we celebrated the two thousandth anniversary of the birth of Jesus and a new stage of the Church’s journey begins, our hearts ring out with the words of Jesus when one day, after speaking to the crowds from Simon’s boat, he invited the Apostle to “put out into the deep” for a catch: “Duc in altum” (Lk 5:4). “Peter and his first companions trusted Christ’s words, and cast the nets. When they had done this, they caught a great number of fish” (Lk 5:6). Duc in altum! These words ring out for us today, and they invite us to remember the past with gratitude, to live the present with enthusiasm and to look forward to the future with confidence: “Jesus Christ is the same yesterday and today and forever” (Heb 13:8). Primary Evangelization… our Missionaries from many countries in sub-Saharan Africa and in countries preparing missionaries to work in Africa they are the ones who GO, leave their own country to bring the Good News of Jesus Christ. Ordinary Evangelization undertaken by all who engage with the passing on of the faith, in the home, in school in our daily lives in the manner in which we witness to the Risen Lord. New Evangelization and now all together we are asked / invited to seek out new ways and means of understanding how we can bring the gospel into our world. We are pilgrims and disciples of a pilgrim Church, each one called to engage in mission as the Lord has called us. The major factor that is changed is now the context into which we bring the Gospel message. We bring the Gospel to our world in a context that is often unfriendly, but yet, not to be feared, hostile but this hostility does not become an insurmountable obstacle. “As Mother of the Redeemer, Mary becomes a witness of God’s love. She freely fulfils God’s will. She is the strong woman, who along with John, remains at the foot of the Cross. She always intercedes for us and accompanies the faithful in their journey as far as the cross of the Lord. We leave this sacred place pondering how we may best participate in the New Evangelisation to which we are all called at this time in the life of our Church. With the Shepherds in Luke’s Gospel we say… Let us Go and turn our sights towards Jerusalem and the fulfilment of the promises of Jesus.